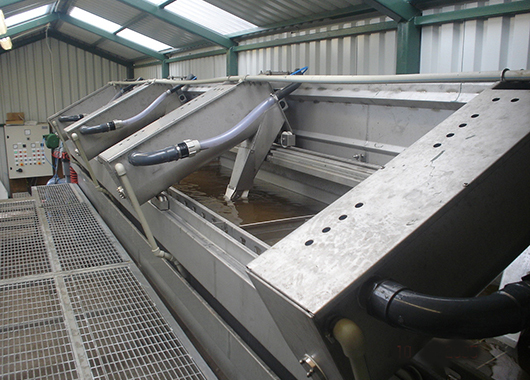 The filter removes the solids from the sand bed whilst it is operating and removing solids from the incoming flow. So, “off-line” backwashing is not required, unlike a conventional filter. Therefore a single filter is sufficient for nonstop operation. This eliminates the need for a standby filter, and the backwash system normally required. It also minimises both the space required and the associated costs. Each Toveko filter fits into a normal height room So, frost protection and installation in “visually sensitive” sites is very straightforward. It also commonly allows gravity flow into the filter from the preceding treatment step (for example settlement). Therefore, an expensive intermediate pumping stage is not necessary. It also ensures that the delicate solids are not broken-up within the pump. As a result, the filter removes the solids more efficiently and easily, which therefore gives you better quality filtered water. 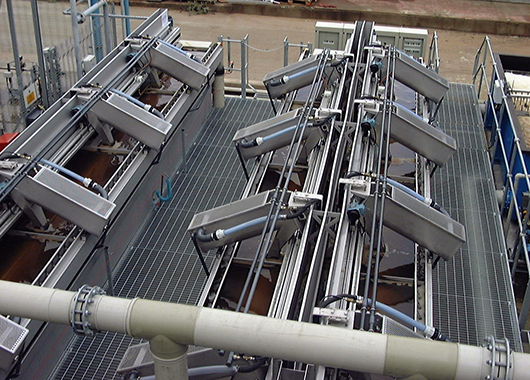 The rotation of the unique sand washer in TOVEKO filters “rolls” the sand grains over each other. The resulting, gently abrasive “rubbing” improves the sand cleaning process, efficiently removing whatever is on the sand surface. When the solids removed are sticky, this difference is really important. The use of polyelectrolyte or presence of oil produces “Sticky” solids. 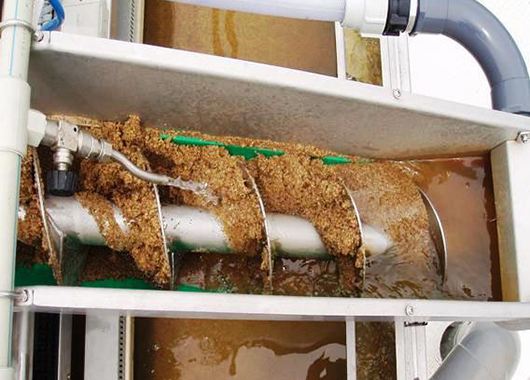 Actually, TOVEKO filters are a very good solution for the removal of residual oil in wastewater. Of course, any sand filter removes oil. However, TOVEKO’s ability to remove it from the sand again so that the filter continues to operate efficiently is unique. For details of the range of sizes and advantages of TOVEKO Filters you can download a leaflet here. You can also download Case Histories and a Reference List. 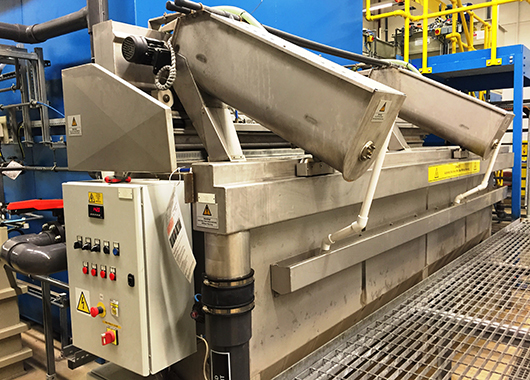 The filter automatically stops washing the sand when flow through the filter stops and the head loss falls to zero. As a result, the filter does not “keep going” when it doesn’t need to. It is therefore more energy efficient. Filter operation re-starts when flow re-starts, and the head loss again increases to its “normal” level . This “stop and start” process just continues, completely automatically. Occasionally an upstream problem may cause a far higher concentration of incoming solids. The filter bed may then start to block and head loss then increases above its “normal” level. The rate of sand washing is automatically increased when this happens. This normally deals with the problem; the head loss decreases, and sand washing rate falls to its normal level. If it does not solve the problem, the head loss across the filter bed continues to increase until it reaches a final switch point. 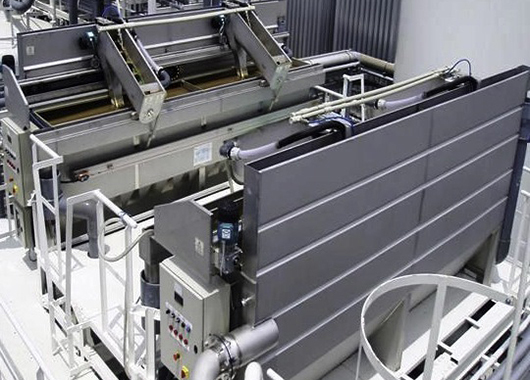 The filter then increases the sand washing rate even further and also generates an alarm. TOVEKO filters are normally constructed in 304 (1.4301) stainless steel. Duplex alloys are available for even higher concentrations (for example sea water).